Operation Safe Child Photo ID Session scheduled for November 23. Families who participate will receive a free, wallet-sized ID card containing a child’s name, biographical information (date of birth, age, gender, height, weight, hair and eye color) and a fingerprint image of both index fingers. The card is created in under two minutes and it can be carried in a wallet or purse. Interested parents can also choose to store the fingerprints, basic biographical information and photos of children – this information may be critical in the event of a lost or missing child. The storage of the information is entirely voluntary and requires the express written consent of a parent legal guardian. Should the parent wish to share the information, it would be digitally recorded and stored in a state database; in the event the NYS DCJS (the agency which stores the information)receives a missing child report, the fingerprints of that child will be included in a special search file and compared against all incoming fingerprints submitted to the agency. 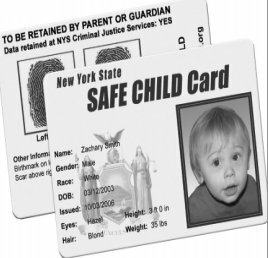 In addition to being able to quickly provide important details to police agencies investigating child disappearances, the New York State SAFE CHILD Card will serve as an important tool when used in conjunction with the New York State AMBER Alert and Missing Child Alert Programs. For more information, call (631) 854-4100. Subject: LongIsland.com - Your Name sent you Article details of "Brightwaters Neighborhood Watch Committee Proudly Collaborates with Suffolk County Legislator Thomas Barraga & NY State Senator Phil Boyle"